St. Clare was born in Assisi, the eldest daughter of Favorino Sciffi, Count of Sasso-Rosso and his wife Ortolana. Ortolana was a very devout woman who had undertaken pilgrimages to Rome, Santiago de Compostela and the Holy Land. Later on in her life, Ortolana entered Clare’s monastery, together with Agnes and Beatrix, Clare’s sisters. As a child, Clare was devoted to prayer. When she turned 12 her parents wanted her to marry a young and wealthy man, but she preferred to wait until she was 18. However, at the age of 18 she heard Francis’s preachings which would subsequently change her life. Francis told her that she was chosen by God. Soon after, on Palm Sunday, when people went to collect palm branches, she stayed home. That night she ran away to follow Francis. Francis cut her hair and dressed her in a black tunic and a thick black veil. Clare was placed in the convent of the Benedictine nuns near Bastia from where her father made several unsuccessful attempts to abduct her, still wanting her to get married. Clare, joined by her sister Agnes, soon moved in a place close to the church of San Damiano, which Francis had rebuilt. Other women joined them and San Damiano became known for its radical austere lifestyle. The women were at first known as the “Poor Ladies”. San Damiano became the centre of Clare’s new religious order, which was known in her lifetime as the “Order of San Damiano”. San Damiano was long thought to be the first house of this order, however, recent scholarship strongly suggests that San Damiano actually joined an existing network of women’s religious houses organized by Hugolino (who later became Pope Gregory IX). Hugolino wanted San Damiano as part of the order he founded because of the prestige of Clare’s monastery.San Damiano emerged as the most important house in the order, and Clare became its undisputed leader. By 1263, just ten years after Clare’s death, the order had become known as the Order of Saint Clare. Unlike the Franciscan friars, whose members moved around the country to preach, Saint Clare’s sisters lived in enclosure, since an itinerant life was hardly conceivable at the time for women. Their life consisted of manual labour and prayer. For a short period of time the order was directed by Francis himself. Then in 1216, Clare accepted the role of abbess of San Damiano. As abbess, Clare had more authority to lead the order than when she was the prioress, who had to follow the orders of a priest heading the community. Clare defended her order from the attempts of prelates to impose a rule on them that more closely resembled the Rule of Saint Benedict than Francis’ stricter vows. Clare sought to imitate Francis’ virtues and way of life so much so that she was sometimes titled alter Franciscus, another Francis. She also played a significant role in encouraging and aiding Francis, whom she saw as a spiritual father figure, and she took care of him during his illnesses at the end of his life, until his death in 1226. After Francis’s death, Clare continued to promote the growth of her order, writing letters to abbesses in other parts of Europe and thwarting every attempt by each successive pope to impose a rule on her order which watered down the radical commitment to corporate poverty she had originally embraced. She did this despite the fact that she endured a long period of poor health until her death. 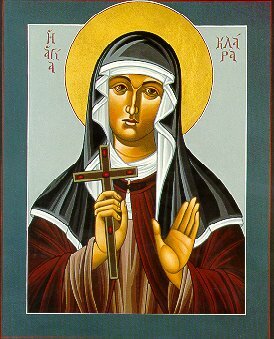 Clare’s Franciscan theology of joyous poverty in imitation of Christ is evident in the rule she wrote for her community and in her four letters to Agnes of Prague.